Roku selling the device at official price at $49.99 from their website. 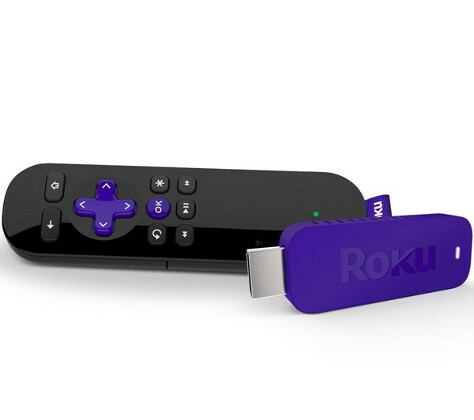 Roku Streaming Stick comes with dual-band WiFi and 720p or 1080p HD video output quality. Not all the apps and services are broadcasting in 1080p though. Also, the device supports Dolby Digital Plus 7.1 surround sound via HDMI. Roku trying to compete Google Chromecast with their streaming stick to make your HDTV smart. While the Chromecast is £20 cheaper than Roku Streaming Stick. You can enjoy BBC iPlayer, Netflix, 4oD, Demand 5, Sky News, Spotify, NOW TV, Channel 4, VEVO, BBC News and more channels. Apps like YouTube for the device brings you all the latest videos in your TV. Comes in a box with a remote control, 2 AA batteries, USB cable, power adapter and a getting start guide. You can control your Roku Streaming Stick with the remote provided. The remote controller is small and easy to use. Additionally you can download their free app in your smartphone or tablet and take the control in your hand. You can also stream local contents from your phone or tablets as well. Internet speed is essential for the streaming and quality. Roku recommends a minimum of 1.5 Mbps for standard definition and 3.0 Mbps for HD content. Where to Buy Roku Streaming Stick? You will get 2 years manufacturer’s guarantee for the Roku 3500EU Streaming Stick. If you have £50 laying around to make your TV smart, visit PC World or Currys website to buy one. Both of them are offering home delivery or order online and collect in store for £49.99.